The wide array of training and networking opportunities our chapter offers are made possible by philanthropic support from our Chapter Partners and Advocates. We offer a number of ways to recognize our supporters to help them increase their visibility and build relationships among AFP DC Chapter members and thousands of associated professionals from not-for-profit organizations throughout the Washington, DC region. Our sponsorship ‘menu’ includes a variety of options for increasing exposure levels to help you achieve your marketing objectives. Many of our sponsorships offer additional benefits specific to each program or event. As a Chapter Partner, you are recognized throughout the year as one of AFP DC’s more generous and loyal sponsors. To qualify, your company commits to $6,000 or more in annual support through a combination of the sponsorship opportunities on the following pages. 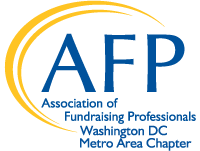 AFP DC Advocates are fixtures in the DC fundraising community, whether as a consultant working with hundreds of nonprofits in the DC metro area, as a vendor to charitable organizations, or as a donor who understands the value of the sector. The DC Chapter Advocates program offers year-long exposure, and opportunities to make meaningful connections with our members at our programs and events. The six annual core education programs offered each year form the bulk of AFP DC’s educational outreach to the fundraising community, and are part of our core mission. Session topics are carefully chosen by the Education Committee from among numerous proposals submitted for review. Each session offers an opportunity to hear from one or more expert speakers, on average, draw 40+ people, and are open to members and non-members alike. Speakers range from nationally known best-practice experts in the field of fundraising, to local practitioners from member organizations who share their ideas and first-hand knowledge. The three annual Advanced Executives programs are open to members and non-members who have been in the philanthropy field for 10+ years, and many in attendance are C-suite level executives with 20+ years of experience. The topics are chosen by the Advanced Executives committee, which is made up of individuals at the pinnacle of their fundraising careers, to be relevant to those with budgetary authority, provide strategic guidance and direction to their organizations, and those who manage other fundraisers, fundraising programs, and operations. Average attendance at each session is 40 people. To provide greater access to educational opportunities, the DC Chapter offers three webinars each year. These sessions are free to our members, and offer key insights on fundraising best-practices and typically cover topics including board development, prospecting, relationship building and more. AFP DC is committed to diversity as a core value, and makes every effort to present a variety of learning and engagement opportunities to meet the needs of our diverse and growing membership. To this end, the Chapter is proud to host two annual Diversity Dialogues events that are designed to help fundraisers learn about and master issues related to diversity in the field of nonprofit organizational resource development. Diversity Dialogues speakers and panelists address issues such as inclusiveness in the workforce, how to build board, donor and prospect diversity, and management’s role in encouraging inclusivity. AFP DC’s December Annual Member Meeting & Holiday Reception is also our main volunteer recognition event of the year. With well over 100 attendees, this event combines networking, recognition and a short business meeting. The member reception in June is a well-established annual networking opportunity that brings together seasoned professionals with younger members in the field. With over 100 attendees, the Sunset Social offers sponsors the chance to engage DC’s top fundraisers in a festive gathering. This is an exclusive reception for AFP DC Chapter members attending the AFP International Conference. Fundraising professionals at all experience levels are welcome at this free monthly event, which draws up to 30 attendees for each session. Over lunch, participants discuss topics that are relevant to them in a less structured, free-flowing environment. This program often appeals to individuals early in their professional fundraising career; those who may not yet belong to a professional fundraising organization; and those who have never attended fee-based educational program. Multiple sponsorships available. NCPC is the AFP DC Chapter’s annual celebration of philanthropy and is held in mid-November each year. The events include a luncheon to honor the top philanthropist and top fundraiser of the year where we expect more than 250 attendees as well as a Day of Service that brings fundraisers together in support of one area nonprofit. AFP DC’s premiere conference, the annual Bridge to Integrated Marketing & Fundraising Conference, is produced jointly by AFP DC and Direct Marketing Association of Washington each year. Held at the Gaylord Hotel at National Harbor in the summer, Bridge reaches over 2,100 attendees annually. Sponsorships range from $1,500 on up. Below is a partial list of sponsorship opportunities. For a complete list and to discuss availability, please contact info@bridgeconf.org or call 703-547-1907. The North American expansion of New Faces of Fundraising—a multi-year initiative— is underway. Professional development grants (formerly scholarships) provide education, training, and leadership development opportunities to help fundraisers and nonprofit leaders succeed. Research that increases knowledge of fundraising, philanthropy, and social innovation includes the Growth in Giving Initiative. Visit the AFP Foundation for more information. You can also contact info@afpdc.org or call 202-524-6888.